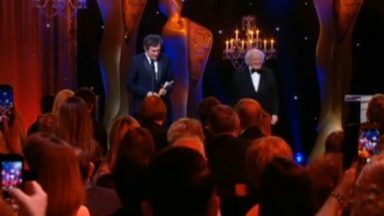 Gabriel Byrne has worked tirelessly for the Irish community, wherever it may be. His commitment to the arts has led him to serving as Cultural Ambassador for Ireland, supporting the Irish Arts Center in New York City by word and deed, and participating in honoring Irish artists, such as William Butler Yeats and Seamus Heaney, whenever the occasion arises. He is a true citizen of Ireland, but his notion of “Ireland” extends far beyond the borders of that green isle. He joins an exalted international company, including writer Mario Vargas Llosa, who, “by writing The Dream of the Celt, opened up the story of Irish national hero Roger Casement to the 650million Spanish and Portuguese speakers around the world,” and attorney Gareth Peirce, who has represented a number of high-profile cases, including the Guildford Four and the Birmingham Six. To be reminded of Mr. Byrne’s accomplishments, you can read about his work as Cultural Ambassador and his many activities involving the Irish Arts Center of NYC. Congratulations Mr. Byrne! Your advocacy work as Cultural Ambassador has made a difference in our awareness and appreciation of the vibrant and cutting edge Irish contemporary arts scene. And your remarks about art in the video are bang on. And yes. That video is absolutely bang on. And unrehearsed, I think. Lovely! Congratulations to Gabriel for this very well deserved award! He did a great job as Cultural Ambassador for Ireland. 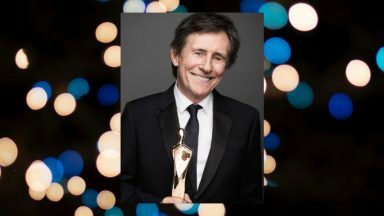 Ireland has so many talented writers and artists and Gabriel Byrne is one of them, but he also knows how to show the world other talents from Ireland. Ireland has so much to offer! Congratulations to our hero. It was meant to be. That was a deep speech from Gabriel and I congratulate him for his dedication to Theatre and the arts in any form.